The 2nd Halal Tourism and Hospitality Symposium organised by FIANZ (Federation of Islamic Association in New Zealand) was successfully conducted on 23rd March 2015, at Auckland Institute of Studies, Mt Albert. The conference was graced by renowned scholars and eminent personalities from the travel and tourism industry from Auckland, India and other South East Asian countries. The Halal Symposium is the brain child of FIANZ and was first conducted last year to facilitate and acknowledge the important catering and hospitality needs of the increasing number of tourists from different parts of the world, especially from Muslim dominated countries. Halal Tourism has an almost similar description to the standard definitions known for the term tourism. Halal tourism mean catering the needs of the increasing number of Muslim tourists from different parts of the world by providing every possible service and food that is Islam compliant and adheres to the norms of Quran. Among various notable scholars and speakers were Dr. Asad Mohsin from Waikato University, Dr. Anwar Ghani who is the President of FIANZ, Dr. Mustafa Farouk- QSM and Meat Scientist from AgResearch in Hamilton, Dr. Adam Brown from NZ for Muslims, Mohammad Kalim Alam of MK Tours in Auckland, Dr. Noriah Ramli from International Islamic University, Malaysia and Syed Mohiuddin of Kiwi Muslim Directory etc. This mixture of proficient speakers gave the conference a broader perspective to the variety of tourists coming to New Zealand and how it has been positively but silently impacting the tourism economy of New Zealand. To elaborate the concept of Halal Tourism, it was noted by the speakers that Muslim tourists have special needs when they travel such as access to Halal food (certain types of meat that can be eaten and are certified to be submissive by Islamic Law), availability of places or locations where they can offer their Salah (Daily Prayers), indicating the direction of Qibla in rooms (the direction of Kaaba in which Muslims pray), non-contamination of alcohol in their food and giving them Muslim friendly packages and services. The goal of this symposium was to identify various small issues or problems that the current Muslim tourists are facing in New Zealand and how the NZ tourism need to prepare themselves to be the best player in the tourism market as compared to other competitive nations. The focus in terms of nations were some of the Asian countries like Malaysia, Indonesia, Korea, China, India, Pakistan and some middle eastern or Gulf countries. FIANZ is a recognised body of Muslim community that governs and issues ‘Halal’ certifications to restaurants, hotels and looks at the area to benefit the community as a whole. Auckland has a Muslim population of around 45000 people which comprises 1% of the total NZ inhabitants and the numbers increasing by the day. This Kiwi Muslim Directory has all the information that a Muslim tourist will be needing both for their short and long term visits. The directory also has the addresses of all the places where Halal meat/food is available, contacts of Muslim merchants and doctors, prayer and Ramadan timings in different cities of NZ, answers to some tricky questions with reference from the verses of the Holy Quran. This directory is free of cost and is highly useful for new people in New Zealand. 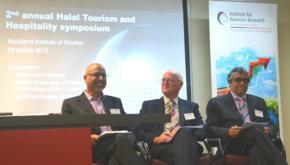 The speakers at the symposium posed different facets of the Halal tourism and how it will have a positive impact on the growth of NZ tourism. Cross questioning and open discussions were done with the panel and the program ended on a positive note. The 3rd Halal symposium is expected to be held in December of 2016 in Christchurch.